Do you curate content for your blog and social media sites? Want to discover how to find remarkable content to share? To learn how to explore content curation, I interview Ian Cleary. In this episode I interview Ian Cleary, the founder of RazorSocial, a marketing tech blog focused on social media tools. His blog has been awarded a top 10 social media blog by Social Media Examiner in 2013 and 2014. Ian is also a very popular speaker. Ian explores content curation, why it’s valuable and tools that make the discovery of new content easy. You’ll discover what content curation is, why it’s important and how to find and share relevant content. Listen as Ian Cleary shares how to find great content to share. After more than 15 years in technology, Ian started doing social media consultancy and training. He wanted an international business that combined his knowledge of tools, technology and social media, which led him to RazorSocial. Ian explains when he started the blog just over two years ago, he initially focused on guest blogging. Ian developed relationships with other people in the industry, seeking out opportunities to guest post on similar sites. It got his name out there and drove traffic to his site, which was the intent. He then had to make sure his site had really good content. Ian has always focused on high-quality content for his blog. Ian now has more than 100,000 visitors to the site every month. They run webinars and sell online training. Ian’s primary focus is to still build relationships and provide quality content. “People are prepared to buy our premium content because they know we deliver good content all the time,” he says. Listen to the show to hear more about Ian’s networking strategy and the story of how we first met. Ian believes that content curation is about finding relevant content and sharing it in a meaningful way. For example, if you do a weekly roundup post, don’t just list article titles and links, instead add the reason why each post is interesting. 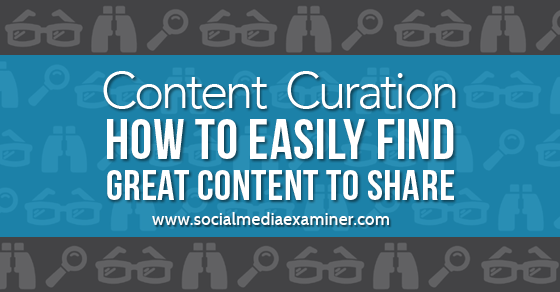 Curated content can be your own articles, as well as posts from others. When Ian compiles his email newsletter, he’ll put in his latest posts, but he also picks out some of his popular older articles, and points out why he thinks they would be valuable for his readers. Listen to the show to discover how Ian curates his own content. Ian explains how content curation builds up a marketer’s authority. If your audience trusts you because you consistently share good content, when you share your own material, they’re more likely to engage. On the flip side, if you share consistently bad or irrelevant content from other sources, people won’t be as interested when you share your own articles. Listen to the show to find out how Social Media Examiner curates other people’s content. When Ian shares other people’s content on Facebook and other social media platforms, he puts a line before the article link explaining what the article’s about and why it’s interesting. Ian also explains how he curates content for posts on his blog. For example, he recently did an article on podcast tools. 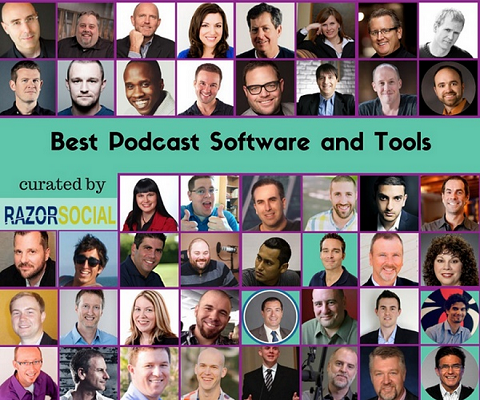 He reached out to podcasters, and asked for their three favorite podcast tools. He compiled the response and wrote a summary. This type of post is both valuable and shareable. The influential people in the article share the post. Plus, Ian created a custom image with a picture of everyone in the article. After the image was posted on Facebook, the people in the article were able to tag each other, giving it even more visibility. Ian created a custom image with everyone included in this curated article. According to Ian, the above podcast post generated about 10,000 visits. Listen to the show to learn how Ian adjusts this strategy for content he curates and shares on Twitter. Ian uses a variety of tools to find good content. Content Gems sends links to you. You specify the categories you’re interested in—such as content marketing and social media—and then you get a daily email of the most shared articles in those categories. They curate it, so there are a couple of lines describing what each article’s about. There are free and paid versions. Content Gems sends you the most popular articles based on your specifications via email. Post Planner is an excellent tool to discover great content on Facebook. Ian uses it to find trending quotes or interesting pictures to mix up the article content. You’ll hear what other great features they offer. They have a limited free version, as well as a paid one. 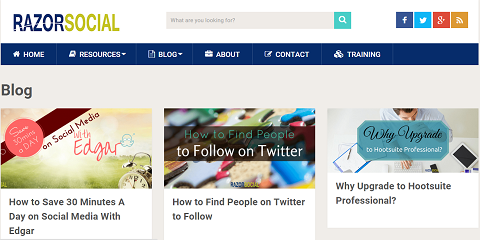 Buffer and BuzzSumo also help you locate trending and popular content. Feedly is manual curation—pick out people you like to follow, and then go through the articles to see if there’s something interesting to share. Finally, Edgar organizes and automates what and when you share. Specify different categories such as your blog posts, other people’s posts and quotes and set up queues. Then decide what time you want to share content. Edgar will automatically pick things out to share from your categories at the specified times. Listen to the show to discover how Ian curates and reshares his older content. Have you ever seen those cool videos that somehow capture what’s on your iPhone? Ever wonder how to do that? Check out ScreenFlow 5 for the Mac. The app costs $99. However, for those who already have a previous version of ScreenFlow, it’s $34 to upgrade to version 5. If you need to record from the screen of your iPhone, it’s definitely worth it! Listen to the show to learn more and let us know how ScreenFlow works for you. In the show, Ian Cleary shares how he makes the trip from Ireland every year, because it’s exceptionally valuable for his business. You’ll also hear from Joel Comm. At the conference, Joel will be talking about how to leverage the power of Twitter to enhance your brand and grow your business. We will have over 100 sessions on literally everything related to social media marketing, including Facebook, YouTube, podcasting, visual design, blogging, corporate and small business social media and everything in between. Visit here to check out the speakers, the agenda and grab your early bird discount. Connect with Ian on his website and on Twitter. Stay updated on the launch of Ian’s new social media productivity course. Sign up for Content Gems and Post Planner. Check out Buffer, BuzzSumo and Feedly. Explore the top social media blogs for 2013 and 2014. Check out ScreenFlow 5 for Mac. Listen to our new podcast, The Social Media Examiner Show. What do you think? What are your thoughts on content curation? Please leave your comments below.